A posh selection of tables and seating arrangement awaits guests from Manteca and the surrounding regions to enjoy special evenings out to dine and party with friends and family at The Veranda targeted to open in late June. 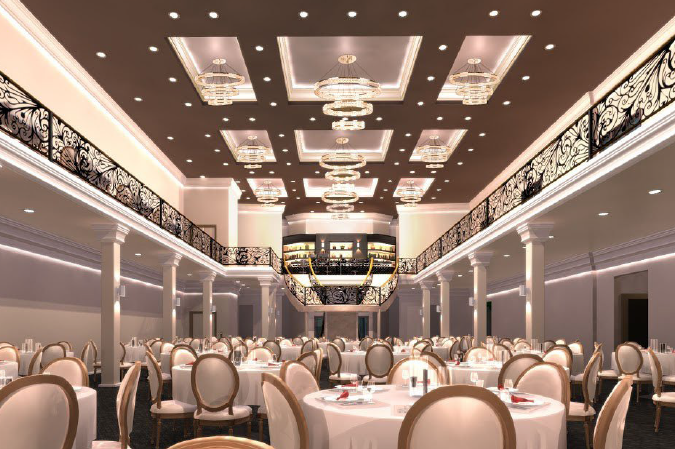 The Veranda — a top tier events center and banquet hall — will open in downtown Manteca in June. It is being created within the walls that were erected 82 years ago to open what was then called the “Grand Dame of Manteca” — the 900-seat El Rey Theatre. The El Rey closed in 1975 after a fire gutted the building after a showing of “The Towering Inferno.” It reopened in 1998 remodeled as Kelley Brewing Company and Brick Yard Oven that closed in 2007. Owner P.J. Singh said that an exclusive restaurant and bar are expected to be opening as well in the two-story building at the end of June. “It will be something special,” he promised as he provided an artist’s rendering showing the new façade that will give the downtown a new icon he feels will make the community proud. The Veranda will occupy the most high-profile location in downtown less than a half a block from the historic and geographic center of Manteca — the Yosemite Avenue and Main Street intersection. Singh also trumpeted the elegant dining room that will fill the ground floor of his facility with tables and chairs that will complement the decor. There will be some 16 chandeliers hanging from the ceiling of the dining room to add to the elegance of his facility that includes a second-floor open air terrace dining experience above the addition that Kelley Brothers added for covered open air dining that faces the northeast corner of Yosemite and Grant avenues. Singh indicated the menu will include Hispanic and Indian cuisine.